I don’t just lie, horizontal, on the couch. I’m usually sitting on the couch, messaging, facebooking, on my laptop, typing up to-do lists on my phone while I catch up on Bold and Beautiful eps in the background. No. I don’t lay. That is unproductive. On one Tuesday night however, many weeks ago, I was lying on the couch. I wasn’t feeling the best, and going up to bed seemed way too hard in the state I was in. Hubbie had control of the remote and I really didn’t care. I just stared. So when he said “that looks good,” luckily, a little part of me took notice. It was the show Food Safari on Foxtel. And the cuisine on discovery that particular week was Lebanese. Hubbie went to bed minutes later, leaving a spent yet still somehow oddly fascinated and suddenly energised enough person, me, laying horizontal but now trying my damndest to pay attention to the food being presented before me, on the couch. It was fresh. They used a lot of bread. They ate with their hands. They created and cooked, with their hands. And the ingredients were readily available. ‘I could make that,’ I observed. I wondered about Lebanese cookbooks. I decided I must buy one. Then, in my cactus state, I decided I had to eat at one. A restaurant, that is. 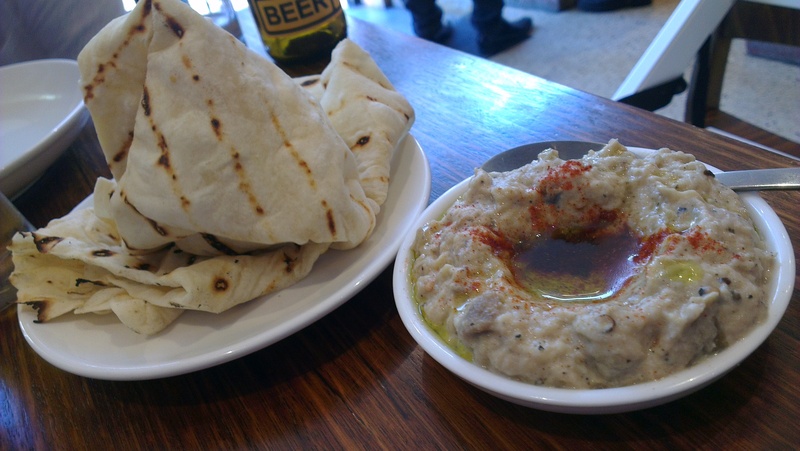 The following day I looked up Lebanese cuisine on Urbanspoon, and promptly made reservations at the current top-rating Lebanese restaurant in Melbourne. Which is how we found ourselves at Bayte for Valentine’s Day. I had been really excited about this leading up to the Saturday night. I couldn’t say for sure that I’d ever had Lebanese food, and yet having seen the dishes on offer via Food Safari there was nothing overly unusual about the meals or the ingredients typical of the cuisine. There was a lot of bread, and dips, and after seeing it on TV I was really looking forward to the Babba Ganoush. Apart from some of these more oily/creamy dishes, lots of the other food options were fresh, simple, yet inventive with the spices and flavours they combined to create the taste explosion in your mouth. I knew I was going to eat a lot. I knew I had to have one of the sickly sweet desserts. And with the heading ‘Lebanese eatery, wine and espresso bar’ on the Bayte web site, I just KNEW I was going to have some of the Lebanese coffee too. We parked off Johnston street, and walked 20 seconds to the restaurant on the main street. Although it was on Johnston street, you could easily walk by and completely overlook it. It wasn’t part of any main strip of shops or restaurants, yet Hubbie and I felt this made it feel off-the-beaten track, a little hidden gem to be explored and discovered within all the rough diamonds waiting to be found in Collingwood. I had booked ahead and sure enough our table was ready and waiting. Luckily it had been a warm day, as we were positioned by the entrance door, and a decent breeze kept wafting in throughout the evening. You’d hope for a closed door in cooler weather. I actually can’t remember if I had in fact mentioned we needed a high-chair, or if it was lost in in the booking conversation, but I distinctly remember saying “2 and a toddler,” yet they had assumed we’d bring a pram. Not to mind, they set up a high chair for baby girl fairly quickly. My work friend had recently had cucumber in one of her alcoholic drinks while out and had told me I just had to have a cucumber drink. So I did. It ended up being a beautiful, fresh offset against the many creamy/spicy dishes we experimented with. A perfect accompaniment to our meals. 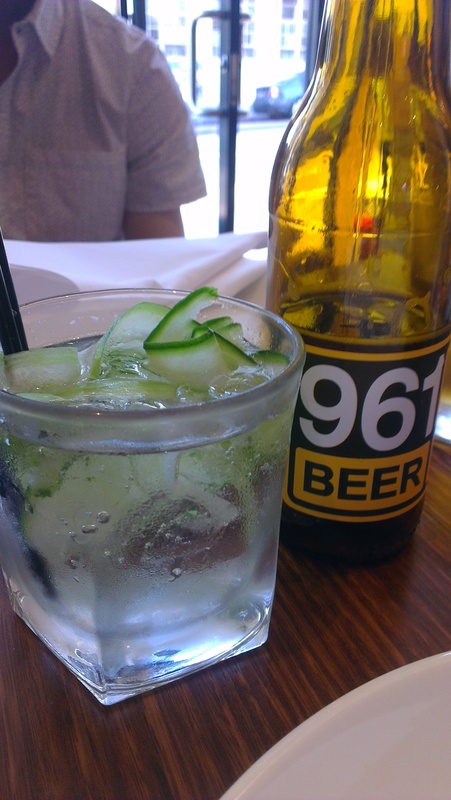 Hubbie started off with the 961 beer, and after trying another one, ended up back with that one again. Also he tried an ‘Arak’ drink. I say ‘an Arak drink’ because I forget which Arak drink it was, but it was sweet with an aniseed taste. It was all a bit sweet to him, as he had also had hints of sweetness in his beer, but we were out and trying new things so I think it was ideal to be venturing out into the unknown, in line with where we were dining. After perusing the menu for a while, we decided on a combination of starters and share main meals. The warm flatbread was warm, and presented rather cas/rustic. Baby girl loved it, and it was oh-so-easy to eat with the Babba, dip dip dipping away into the delicious, spicy, garlic-y, eggplant flavours all rolled into one. It was creamy, yes, spicy, yes, and a tad oily – but in a good way. It was really fresh though, not something you’d eat too much of and then feel sick and remorseful for doing so. 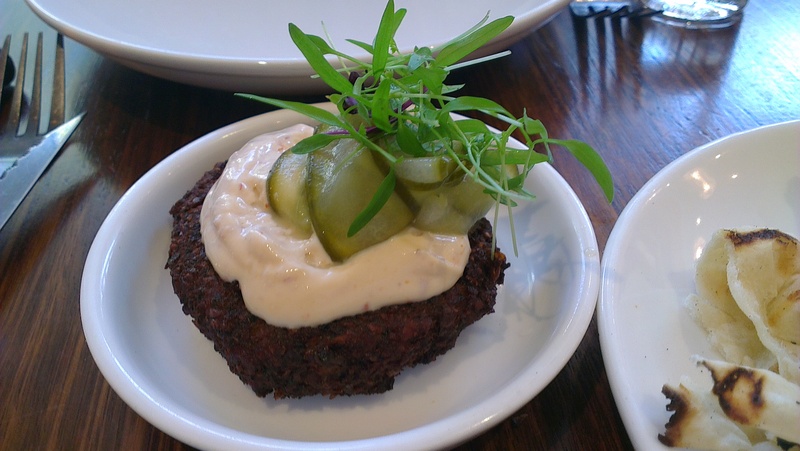 The falafel was spicy too, and it was only at the end I thought ‘why don’t I actually eat it with the gherkin on top?’ When I did, the flavour explosion of sour and spice was even more intense. I suggested Hubbie do the same and give it a go, however unfortunately our waitress asked if we were done, in wanting to clear the plates from our table, and obviously mistook the “no we’re right” to mean ‘we’re right we’re finished,’ as she took it away before we had a chance to protest. That was slightly disappointing, and I felt bad for Hubbie as he hadn’t had the chance to have the last flavoursome bite, but fortunately for us that was the only disappointing factor that night. The menu was inspiring in its range of small/share/large plate options, and it certainly excited me going from our positive experience at Café Maritana not too long ago. Also, there’s something appealing about being able to order many little plates as opposed to just two large ones, as the option to eat such a variety of foods and get more of a taste of the cuisine on offer is so much more pleasing and satisfying, especially when experiencing a new culture and wanting to see as much of its food as you can. These people love their dips. 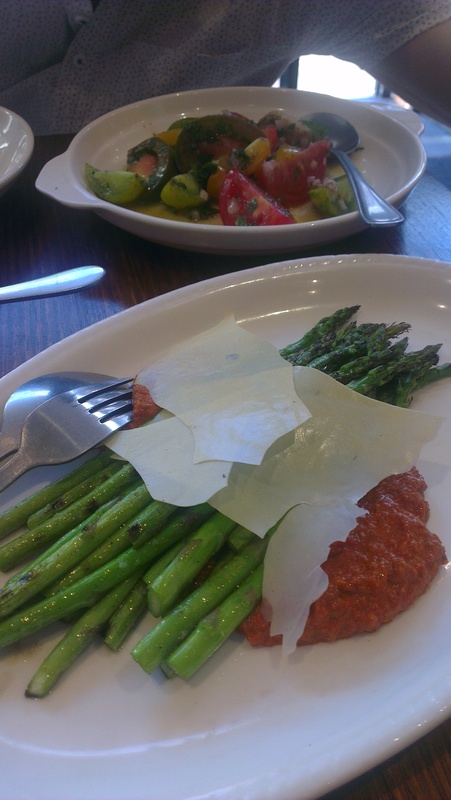 The asparagus had a tangy spicy sauce on the side (I’m assuming that was the muhammara?) 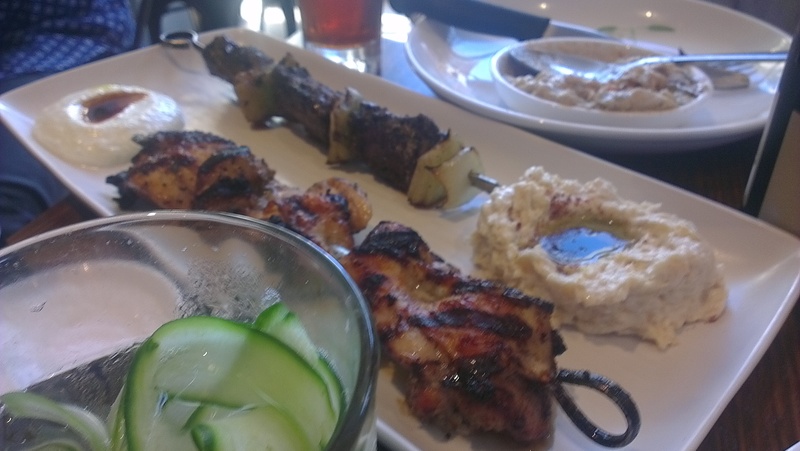 and our skewers had come with a garlic-style dip and also a hummus one. They’re not afraid of lots of spices and flavour, and it showed. The red dip amongst the asparagus was flavoursome, and the garlic dip situated with the skewers was my favourite, so yum. The garlic chicken glazed in pomegranate molasses had great flavour, Hubbie loved it especially, and the lamb backstrap was good too. 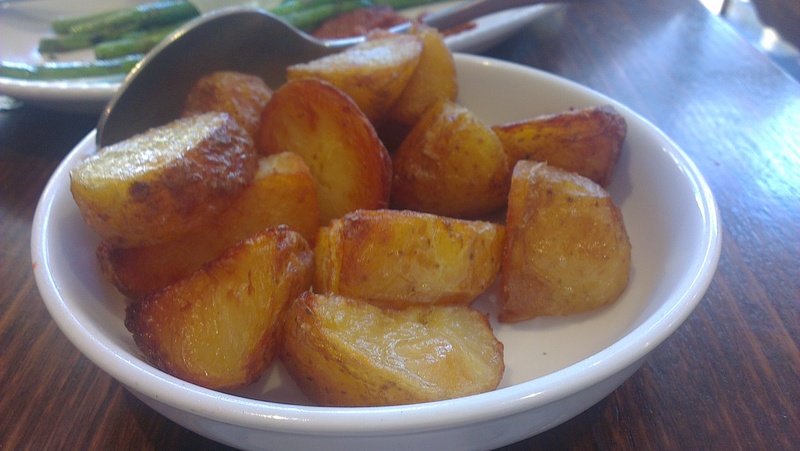 The potatoes were great and a beautiful golden colour, which I’m sure I can attest in part to the lamb fat. 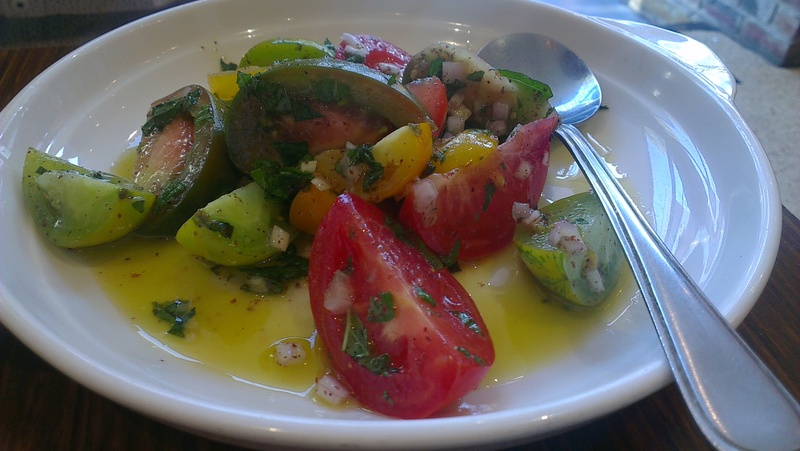 Again like Maritana, the salad shone, and I loved the fresh and biting flavours of the tomato with mint and eschalots. The combination of this dish was just brilliant, I loved it. In retrospect, we should have ordered more. That seems silly I know with all of the above, but we were drinking, and with alcohol comes a healthier appetite. Not only that, but because the meals were healthier, and a good portion of the meals ordered were vegetables, we really could have fit more in, and should have gotten at least one more skewer to share between us, at least. Us Europeans and our oversized appetites, I know. Just a thought for next time, and something to ponder for anyone planning on their share plates. Although we were still bordering on full, there were no sickly feelings of over-stuffing or overconsumption, and of course it was Valentine’s Day so damn it we were going to have something sweet! 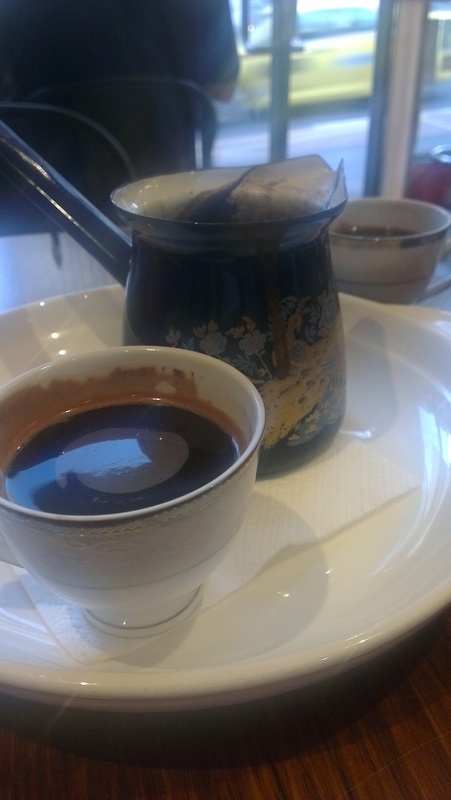 And we had to try the Lebanese coffee – any self-respecting coffee snob wouldn’t dare exclude this from their dining list, no matter how full of food they were! The doughnut was… filling. After all that food, (maybe better we didn’t get the extra skewers!) I was still glad I got it, and I did eat most of it as Hubbie was too into his beer at this point to really want much of it. 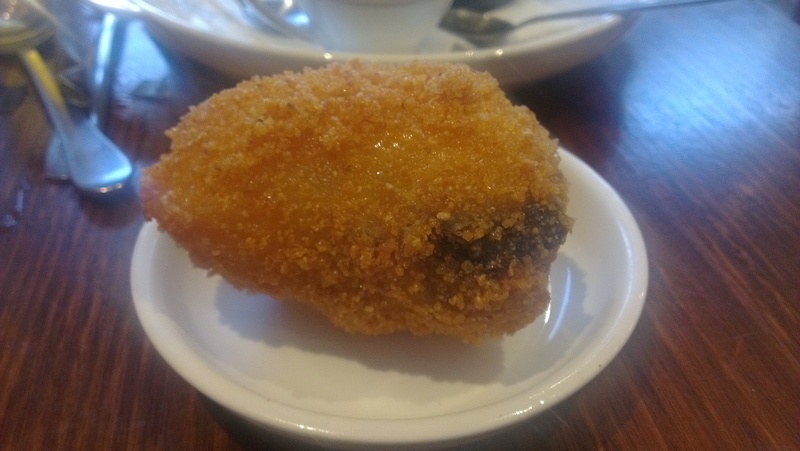 The outside was a beautiful golden crust, yet inside it was doughy, not doughy as in not fried enough, but doughy as in the way a doughnut should be, lovely and soft and fresh. The filling was liquid goodness, and the combination of flavours made it very sweet, but very very moorish. OMG I’m still thinking of it. I think I have to have it again. No, I will have it again. I devoured it, and the combination of it with the Lebanese coffee was perfecto. Our waitress was right. She had said Lebanese coffee was similar to Turkish coffee, though not as strong. Our backgrounds meant we had come across Turkish coffee only a million times before, so we knew what we might expect. 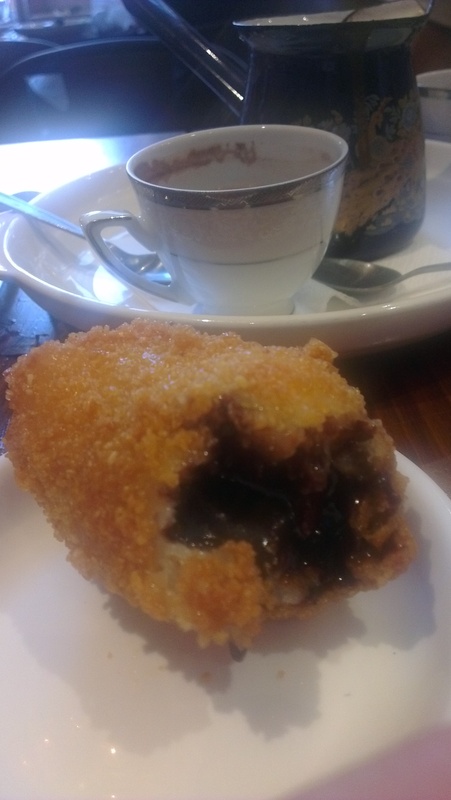 I did find it strong at first, but once I started on the doughnut I realised they were made for each other: Lebanese doughnut and Lebanese coffee = mmm. You can’t have one without the other. The coffee was made for the sweetness of the doughnut… it became a necessity. And I have to add, I loved the old-fashioned cups and coffee pot it was served in. So old-school, so authentic. Some things must be left the way our parents used to do it. Baby girl liked her a bit too much, yelling out when she walked away to actually do some work, leaving us to remind her “honey, she can’t talk to you all day, she actually has to do some work!” The guy behind the bar and even another waitress were all friendly and nice to us and baby girl, even the chef who walked out the door at one stage gave a kind smile our way, and it’s become my firm belief that a nice chef will put more love into your food than a cranky one. Gordan Ramsay might disagree with me on that one but f^$k him. The restaurant had been sparse when we had arrived at 6ish, and by the time we left just after 8 (yes we ate all that food in under 2 hours) it was rocking. Even though the tables were fairly close together the only diners we had a chance to kind of look at and become familiar with were the ones beside us where there were two couples, and they were more than happy to look baby girl’s way and coo at her, making her indeed a happy girl. And the last, sweet touch? Our waitress offering us some free couple of pieces of baklava for baby girl, as we were having our dessert and coffee. Aww, shucks. She totally loved it, by the way. Bravo (or however you say it in Lebanese). Food: 9/10. Flavour, herbs, spices, made it a party in your mouth. Coffee: 7.5/10. Different, but great with the sweets. Ambience: Magnificent. I really, really loved the style of this place. I particularly loved the antique yet classy lamps of different colour/shape/pattern adorning the restaurant, some hanging high and others cascading down low in a beautiful flowing presentation. I also loved the low bookshelf I was sitting in front of, that separated us seated at the front part of the restaurant, from the people behind us seated a few steps up in the second half. I didn’t have a chance to venture to the facilities but Hubbie told me that it wasn’t overly spacious, seating-wise behind us, and that in addition to the above there appeared to be some covered seating outside. This lack of seating space only added to the cosy atmosphere, and makes it even more of a rustic gem of a restaurant. I really loved the ambience and style. Old-world meets class meets Collingwood. I can’t say it any better than that. So unique. Staff: Friendly, helpful and accommodating. And genuine. People: I was surprised by how many older groups of people ventured here! To Collingwood! I mean I say not a bad word about Collingwood, I support the club for goodness sakes… I was just not expecting that number of older, rich-looking people to come through the doors post 7pm. I must have been expecting more of an eclectic crowd, which really there was very little of. There were many groups that night, which might be odd given it was Valentine’s Day (and isn’t that usually a couple thing?) but hey, whatever the people want. The foursome next to us were in their 30s, and as I write that I realise so are we, so I’ll change that to late 30s-early 40s. Generally a nice crowd, if you know what I mean. Price: $121. That included 5 alcoholic drinks, 3 starters, 4 main share dishes, dessert and coffee. I thought that was a good effort, and a good price considering. Hubbie did point out that many of the dishes were still expensive for what we got, and after pondering the receipt I thought he might be right. For example the asparagus was $14, maybe a bit steep for green vegies, but then the skewers were $8.50, about on par for meat? I still think overall the prices were very acceptable for what we received, especially in respect to the beautiful Lebanese flavours (oh, drool). 1. Firstly, book. Their web site states that they only take bookings several days before the day required, however when I called a week and a half earlier, they were taking bookings then. So maybe it was an event thing being Valentine’s Day. Having watched all the people roll in that night, I think practically all of them had booked. Again, it might have been an event thing due to the day. Because of this 3 girls walking in off the street had to be turned away, and Hubbie heard one of the waitresses on the phone apologising for not being able to squeeze in someone wanting to book last second. So, book, book, book. I think being the number one Lebanese restaurant on Urbanspoon makes it very sought after, and rightly so. 2. If it’s cold and you have a child, don’t sit near the entrance. 3. Don’t be tricked by the servings, or by the fact that you’ve ordered 4 dishes to share so for sure you’ll be full. Look at what it is you’re eating and if it’s likely to really fill you up. If you’re not of European descent, disregard this entire point. In a nutshell: I really think I need to go back and eat another doughnut. That thing is infiltrating my mind.